As far as summer craft beer cocktails are concerned this IPA mango slushie is a star. It is also the second easiest thing I’ve made for this blog of ours, the first one being the Radler Bier. We don’t have a pool, but I am trying to convince the people at the ‘lifestyle fitness’ club we are members of to add this slushie to their outdoor poolside drinks menu. To diversify from overly sweet daiquiris and piña coladas. We live in Fort Collins, Colorado after all, home to several award wining craft breweries and the thousands of their devout followers. People love their craft beer here, from the must have IPAs to the super fancy wild fermented, oak aged in a former (your choice of liquor) barrel brews. This is a craft beer lovers’ town – of course craft beer cocktails will be appreciated on a poolside drinks menu. If they did add an IPA mango slushie, I wouldn’t have to bring my own in a stainless steel water bottle whenever I decide to lounge by the outdoor pool. Just kidding. I never get to lounge by the outdoor pool. Usually, I go there to keep my little one away from trouble and enjoy playing with him. So I stay alert and drink ice cold water. But I like to think that one day, I could actually go there with Chris, or with a friend, or even just have a date with a good book and order an IPA mango slushie to enjoy. Undisturbed. Enough of daydreaming, moving on to the recipe friendly words of advice on putting together this slushie. For this photo session I made a ‘vicious’ version of it and used an imperial IPA. A home town brewed one too – New Belguim Voodoo Ranger Imperial IPA. With all of its piney, citrusy aromas and supper bitter, tongue numbing affection. The IBU is 70, but I swear it feels so much higher when contrasted with the delicately sweet fresh mango flavor. With an ABV of 9% it gracefully welcomed the addition of the super finely crushed ice/mango flurry and became an IPA slushie to remember. Choose whatever IPA you like. Seriously. Of course, if the hops profile is inclined towards suggesting tropical fruit aromas/flavors, namely mango-ish…. so much the better. I’ve even tried it with Chris’ second batch New England style IPA (he is so talented of a home brewer, if I say so myself). By the way, did you hear about the new addition to the recently officially recognized style of the New England IPA category? Milk shake IPA… Milk shake IPAs are lactose enriched NEIPA brews with an even creamier mouthfeel. They are becoming so popular that soon they may need to be recognized as an official category too. 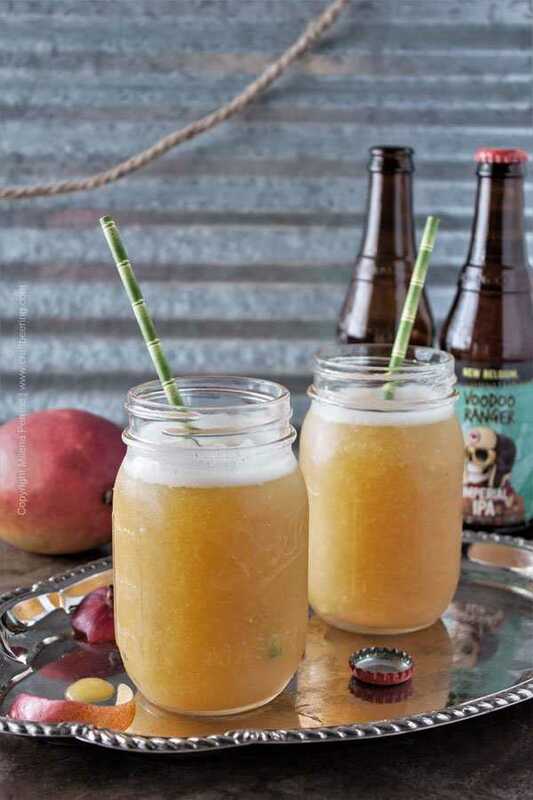 Before I wrap up with the recipe card for this summer’s delight of a craft beer cocktail, let me just suggest this (in case it has not crossed your mind yet). You can always add a shot of vodka to your IPA mango slushie if your chosen IPA is on the lower side of ABV… Cheers my our friends! The ultimate poolside cocktail. Or at least it's cousin. But who cares about that kind of detail? An ice cold, fragrant, flavor loaded IPA cocktail. Divide the IPA between two glasses. Mason jars work just fine. Combine mango pieces with ice cubes in a blender. Blend. 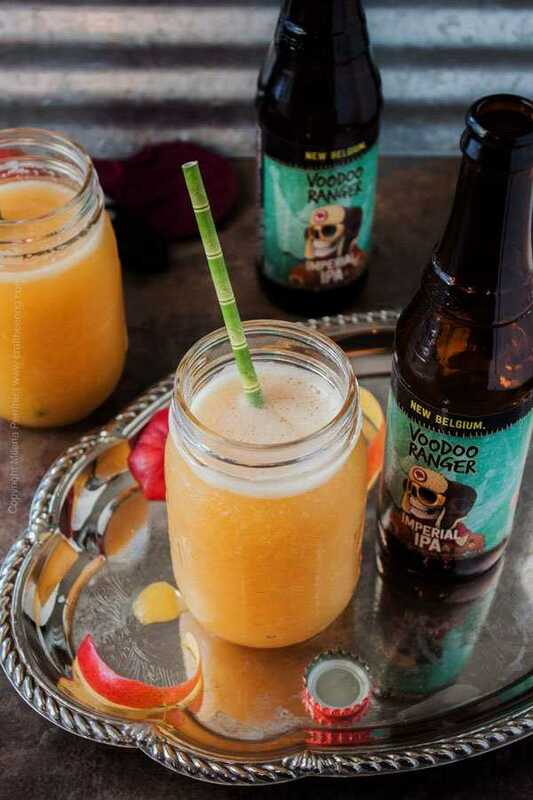 Add blended ice/mango to each glass with IPA. Stir well, add a straw and enjoy. This one might change your mind about tasty craft beer:) Thank you, Christina for stopping by! There is definitely something about men loving IPA more than women do…no statistics yet on the mango:) Thank you for stopping by Amber! Beverly, thank you so much! 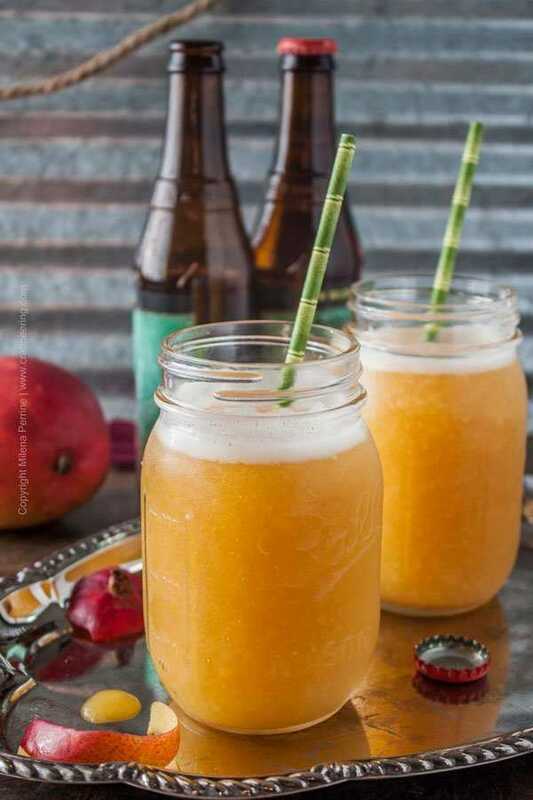 I am glad that I bragged on your blog:) I am pretty sure that you will like sipping on an IPA mango slushie:) Cheers! Perfect for hot summer days! 🙂 Thanks for sharing at Sew It Cook It Craft It. You’re one of my features today. Thank you so much Lina! Not that it is entirely related, but I loved the Indian bracelet picture on your Instagram feed today! I would wear it and hold my IPA mango slushie with the same hand. It would be a beautiful sight! I almost hate to admit this. I’ve never been a beer drinker, but this looks delicious! 🙂 Thanks for sharing with SYC. Thanks Jann! We certainly hope to inspire more people to discover the wealth of flavors craft beer offers. Craft beer has nothing to do with the mass produced and tasteless lagers that have been dominant for the last few decades. 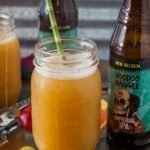 Looks like a delicious drink for IPA fans! This should be available beside a pool. My husband will flip for this I think. Pinning to surprise him. My husband is all in on the craft beer lifestyle. 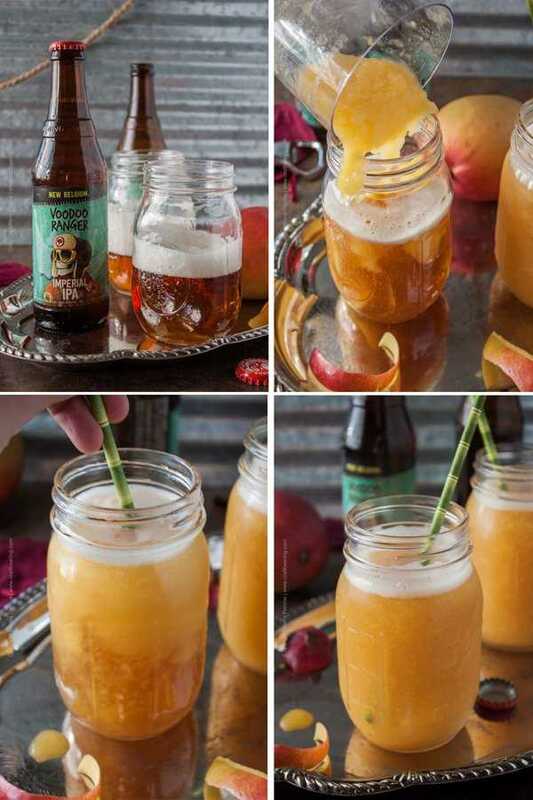 I’d rather drink wine, but I love to cook with all kinds of beer, so this looks like a great option for us! Thanks so much for sharing at the #happynowlinkup! This drink looks so refreshing and perfect for summer. Thanks for sharing with us at #BloggersPitStop and I hope you have a fabulous weekend. Holy Moly! Can hardly wait to give this a try. The neighbors come over and all hang out in our driveway… I’m going to be the hostess with the mostess! Thanks for sharing on the Artsy Fartsy Link Party! This really is the nectar of the Gods. I am a huge IPA fan. It makes me so happy. This sounds great! IPA’s are a hit and miss for me. Anything too hoppy I’m not a big fan of but this sounds just delicious! A great way to chill off with the hot days! Cant wait to try it! We have similar tastes then Brittany:) I’ve always preferred the maltier British IPAs. Thank you for stopping by! I’m not a huge fan of IPAs I’m not sure what it is but they just don’t tickle my taste buds, but that doesn’t stop me from trying them. I figure there must be an IPA out there that I will love. Maybe I’ve had it all wrong, I know I would love this IPA Mango sushi 🙂 and it’s crazy easy to make. OMG! these look amazing and will be perfect to make for our upcoming beach trip. We are staying a house with friends. I can’t wait! THank you so much! Cheers! Thank you Marnie! I hope you have a great time at the beach. Sounds exciting! omg! back in Australia there was this amazing brewery in Western Australia that did Mango Bee and IT WAS THE BEST! the combination was just amazing! this looks fantastic, never would have thought to have done this! Ooh can I be the friend who joins you by the pool? This sounds so refreshing and perfect! I can’t believe you fitness club isn’t jumping all over it! Have a great week, Milena! Kelsie, I would love to hang by the pool with you all day, even if we didn’t have IPA mango slushies:) But better with, and some of your ice cream cake treats.